Starting Wednesday, the vast majority of Americans can learn about every potentially harmful chemical in their drinking water and what scientists say are the safe levels of those contaminants. The Environmental Working Group's (EWG) new national Tap Water Database is the most complete source available on the quality of U.S. drinking water, aggregating and analyzing data from almost 50,000 public water systems in all 50 states and the District of Columbia. The organization has earned a reputation for ambitious data-mining research projects that shake up policy debates and consumer markets. EWG's online Farm Subsidy Database, listing millions of subsidy recipients, and its Skin Deep guide to more than 70,000 personal care products, draw tens of millions of visitors every year. 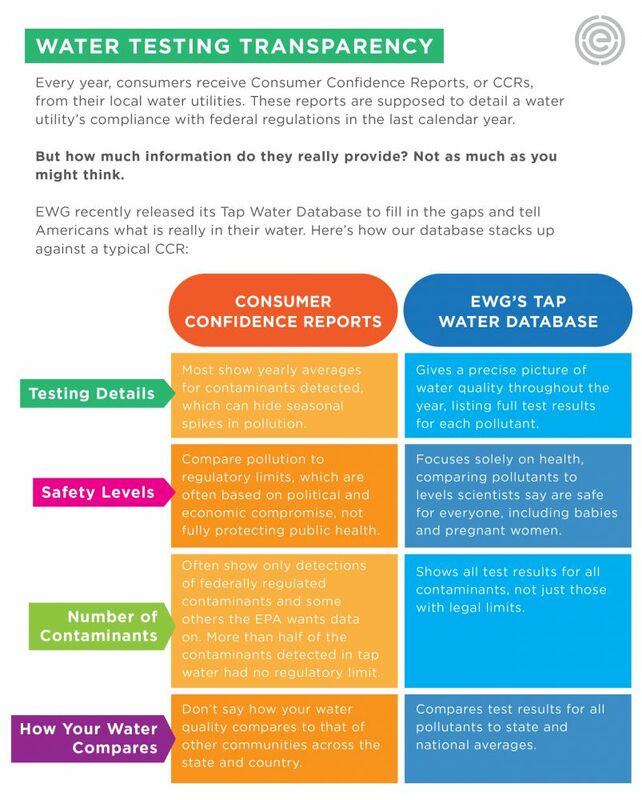 With EWG's new Tap Water Database, simply by entering their zip code or local utility's name, users will find all contaminants detected in tests by the utilities themselves and reported to federal or state authorities. Instead of comparing the levels of pollutants to the legal limits set by regulatory agencies—often the result of political and economic compromise, or based on outdated studies—EWG's guide relies on what the best and most current science finds are the levels that will fully protect public health, especially that of infants, children, pregnant women and other vulnerable populations. "Americans deserve the fullest picture possible of what's in their tap water," said EWG President Ken Cook. "But they won't get that information from the government or, in many cases, from their utilities. The only place they'll find that is EWG's drinking water report." Click here to see how EWG's Tap Water Database stacks up against a local water utility's Consumer Confidence Report. The disturbing truth is that, all too often, a glass of tap water also comes with a dose of industrial and agricultural contaminants that have been linked to cancer, brain and nervous system damage, or developmental defects. "Just because your tap water gets a passing grade from the government doesn't always mean it's safe," Cook said. "It's time to stop basing environmental regulations on political or economic compromises, and instead listen to what scientists say about the long-term effects of toxic chemicals and empower Americans to protect themselves from pollutants even as they demand the protective action they deserve from government." The vast majority of utilities are in compliance with federal regulations, but their water still often contains contaminants in concentrations exceeding the levels that scientists say pose health risks. Many of the existing legal limits are set far above levels that are truly health protective. Because the U.S. Environmental Protection Agency (EPA) has not added a new chemical to the list of regulated contaminants in 20 years, more than half of the contaminants detected in U.S. tap water had no regulatory limit at all, meaning they could legally be present at any concentration and that utilities don't have to test for them or tell their customers about them. EWG researchers spent the last two years collecting data from state agencies and the EPA for drinking water tests conducted from 2010 to 2015 by 48,712 water utilities in all 50 states and DC. All told, the utilities tested for approximately 500 different contaminants and found 267. 93 linked to an increased risk of cancer. More than 40,000 water systems had detections of known or likely carcinogens exceeding established federal or state health guidelines—levels that pose minimal but real health risks, but are not legally enforceable. The safety of the nation's drinking water was thrust back into the headlines in the summer of 2015, when extremely high levels of lead were discovered in the water supply of Flint, Michigan. Data compiled by EWG shows that between 2010 and 2015, nearly 19,000 public water systems had at least one detection of lead at levels that could pose a risk to bottle-fed infants. Chromium-6, made notorious by the film Erin Brockovich. This carcinogen, for which there are no federal regulations, was detected in the drinking water supplies serving 250 million Americans in all 50 states. 1,4-Dioxane, an unregulated compound that contaminates tap water supplies for 8.5 million people in 27 states at levels above those the EPA considers to pose a minimal cancer risk. Nitrate, chemical from animal waste or agricultural fertilizers, was detected in more than 1,800 water systems in 2015, serving 7 million people in 48 states above the level that research by the National Cancer Institute shows increases the risk of cancer—a level just half of the federal government's legal limit for nitrate in drinking water. The new national drinking water guide is the latest in a long line of large database projects from EWG that have helped shape federal policy debates and shifts in industry behavior alike. EWG last published a national drinking water report in 2009 in collaboration with the New York Times' Charles Duhigg as part of the paper's award-winning investigative series, Toxic Waters. Using EWG's tap water data and analysis, the Times detailed how the failures of the federal Safe Drinking Water Act have allowed millions of Americans to drink water with levels of contaminants that "can pose what scientists say are serious health risks—and still be legal." Because federal drinking regulations are inadequate, Americans are left to take matters into their own hands. The first step concerned consumers can take is to buy an in-home water filtration system. Along with the Tap Water Database, EWG also provides a list of filter systems that can significantly reduce the contaminant levels in their water.